?TITLE : Expert Oracle Database Architecture: 9i and 10g Programming ?
? Techniques and Solutions ? ?AUTHOR : Thomas Kyte ? ?ISBN : 1590595300 ?MAKER : BBL ? ?EDITION : 1st ?SUPPLIER : BBL ? ?PUB DATE : September 15, 2005 ?PACKAGER : BBL ? ?LANGUAGE : English ?FORMAT : PDF ? ?RLS DATE : 02/04/06 ?SIZE : 4,75 MB ? ?This book will help you make the best use of Oracle technology. Emulating ? ?Tom's rational methodology, and demand for proof-by-example, will make ? ?you a far better technology thinker. Without question, this is one of the ? ?most importantly Oracle books you can possess. Ken Jacobs, Vice President ? 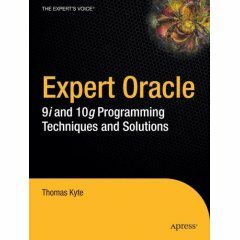 ?This is a defining book on the Oracle database for any developer or DBA ? ?who works with Oracle-driven database applications. Tom has a simple ? ?philosophy: you can treat Oracle as a black box and just stick data into ? ?it or you can understand how it works and exploit it as a powerful ? ?computing environment. If you choose the latter, then you will find that ? ?there are few information management problems that you cannot solve ? ?Expert Oracle Database Architecture is the first of a three-book series ? ?that completely explores and defines the Oracle database. It covers all ?
? - Files, memory structures and processes ?
? - Locking and latching ?
? - Transactions, concurrency and multi-versioning ?
? - Tables and Indexes ?
? - Partitioning and parallelism ? ?Each feature is taught in a proof-by-example manner, not only discussing ? ?what it is, but also how it works, how to implement software using it, ? ?This fully revised edition covers both the 9i and 10g versions. It also ? ?comes with a CD containing a searchable PDF of the 8i version of the ? ?Tom has fully revised and expanded the architecture-related sections from ? ?Expert One-on-One Oracle (a searchable PDF of which is included on the CD ? ?accompanying this book), and added substantial new material. He focuses ? ?solely on 9i and 10g architecture in this book and refers to the CD for ? ?In summary, this book provides a one-stop resource containing deep wisdom ? ?on the design, development and administration of Oracle applications, ? ?written by one of the world's foremost Oracle experts, Thomas Kyte. ?